Junipers Garnished with Tangerine Tentacles and Orange Goo. Our wet weather this spring has triggered spectacular spore production by three types of rust fungi on junipers in southwest Ohio. All three fungi belong to the genus Gymnosporangium and each must alternate between a member of the plant genus Juniperus and members of the rose family (Rosaceae) in order to complete their life cycle. The requirement to cycle between two types of widely divergent host plants coupled with the rusty color of their spores earns these fungi the collective moniker of "heteroecious" rusts. 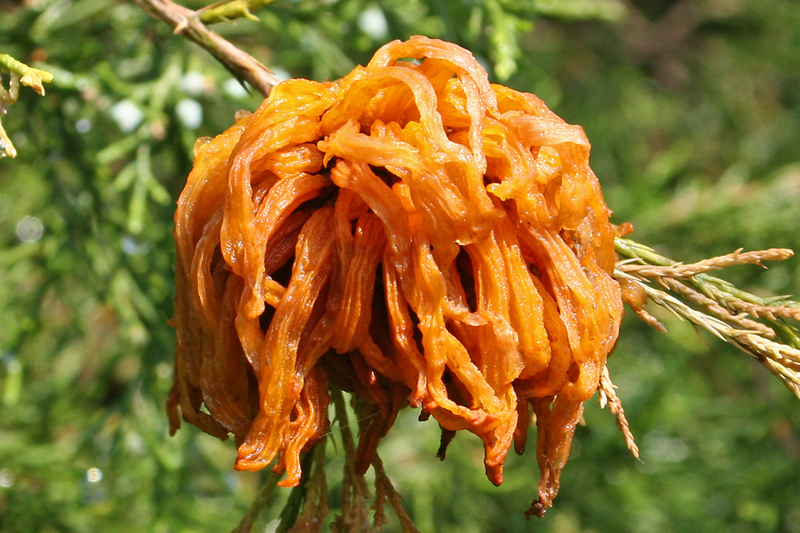 CEDAR-APPLE RUST: the fungus, G. juniperi-virginianae, produces the disease known as cedar-apple rust. The "cedar" part of the disease name comes from the common name for eastern red cedar (Juniperus virginiana), which is a type of juniper; the fungus does not infect cedar. The "apple" in the disease name comes from the alternate hosts which include apples and crabapples. The fungus produces large brain-like galls on the stems of juniper from which tangerine orange, gelatinous, tentacle-like “telial horns” are extruded in the spring during wet weather. The horns are composed of fungal teliospores, which give rise to basidiospores that are ejected into the air to drift onto apple hosts where they germinate, marking the beginning of the other half of the fungal life cycle. Occasionally, this fungus will infect hawthorns. Fungal infections cause little harm to both their juniper and apple hosts, unless you’re an apple grower. CEDAR-HAWTHORN RUST: the fungus, G. globosum, produces the disease known as cedar-hawthorn rust. This fungus also produces irregularly shaped galls on junipers, but the growths may arise from the needles as well as the stems and measure only 1/4 - 1/2" in diameter which is much smaller than the galls produced by cedar-apple rust. Short, blunt, gelatinous telial horns emanate from the galls in the spring. During periods of extended wet weather, the telial structures may ooze mucus-like onto the stems and foliage beneath the galls. As its common name indicates, hawthorn is one of the alternate rosaceous hosts. However, the fungus will also infect apples and crabapples as well as occasionally infecting serviceberry, quince, and pear. As with cedar-apple rust, this fungus causes little harm to its juniper and apple hosts. CEDAR-QUINCE RUST: the fungus, G. clavipes, produces the disease cedar-quince rust. On junipers, fungal infections result in elongated canker-like stem swellings that covered in longitudinal cracks in the bark. During wet weather in the spring, bright orange spores ooze globule-like from the cracks. This rust has a much wider rosaceous host range compared to the other two rusts. Aside from infecting its namesake quince host, the fungus may also infect serviceberry, chokeberry, apple/crabapple, cotoneaster, pear, mountainash, and hawthorn. Some of the most dramatic signs and symptoms of infection are found on hawthorn where infected fruits sprout peculiar looking bright orange tube-like spore structures (aecia). Fruits covered in "orange hair" reduce the aesthetic appeal of heavily infected trees and the bright orange spores (aeciospores) shed from the aecia will settle onto sidewalks, patios, outdoor furniture, slow-moving gardeners, etc., to bestow a noticeable burnt-orange patina. The fungus also infects hawthorn stems and thorns causing more significant damage. Cankers associated with stem infections can produce significant twig dieback causing serious harm to heavily infested trees. The dieback may become widespread throughout the canopy with the overall tree symptoms mimicking a severe case of bacterial fire blight.